Drs. Chris DeMille and David C. MacKay incorporate advanced technology into many of the restorative dentistry procedures at our West Valley City, UT, and North Salt Lake, UT, practice. Whether you are missing teeth and interested in implants or suffer from decay, we can effectively restore the strength and appearance of your smile. Our doctors place and restore both traditional and mini dental implants. We offer All-on-Four® and use Hiossen implants for the best results. Both Dr. DeMille and Dr. MacKay are certified with the International Congress of Oral Implantologists, and Dr. DeMille holds mastership status with the prestigious organization. We ensure our patients' comfort with nitrous oxide or full sedation with an anesthesiologist, if preferred. The doctors can also perform autogenous bone grafts or sinus lifts, to improve a patient’s candidacy for implants. With a sinus lift, implants can be placed the same day. 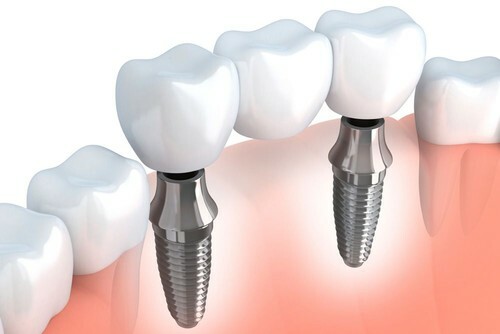 We also offer immediate-load implants for eligible patients. Using CEREC®, an onsite milling machine and dental restoration design software, our doctors can design, fabricate, and place all-porcelain, custom crowns in a single visit. With same-day restorations, you will not need a temporary crown or a follow-up visit. CEREC® involves taking a digital impression of a prepared tooth, then using special software to design a unique restoration. Once the doctor has selected a block of porcelain that matches the color of your teeth, the in-office milling machine fabricates a restoration in about one hour. Then, the doctor securely attaches the custom crown, and the entire procedure is complete. Dental bridges are designed to replace one lost tooth or a few teeth in a row. Our doctors use CEREC® to fabricate custom porcelain bridges of up to three units, or false teeth, in a single visit. For larger bridges, we send digital impressions to our laboratory. In approximately two weeks, ceramists at the lab create a custom bridge from all porcelain, zirconia, or zirconia fused to porcelain. We prefer not to use metal, so our bridges look completely natural. These materials are also durable and long-lasting. Full mouth reconstruction, also known as full mouth restoration, involves a treatment plan of two or more procedures, intended to improve the health, function, and appearance of a patient's smile. The restorative benefits of the customized treatment plan are just as great as the cosmetic effects. At your consultation and examination, Dr. MacKay or Dr. DeMille will advise you on which procedures are best for your needs. The treatment plan may include periodontal therapy, root canal therapy, extractions, implants, bridges, crowns, fillings, ClearCorrect orthodontics, or other treatments. We can complete most procedures in-house, allowing us to offer convenient and streamlined care. Similar to a filling, an inlay or onlay restores a decayed or fractured tooth. However, fillings are direct restorations, while inlays and onlays are indirect – meaning they are fabricated outside the mouth. Inlays and onlays are often referred to as partial crowns, because they offer a more comprehensive restoration than a filling. Inlays fit within the cusps, or ridges, on the biting surface of a molar, while onlays cover one or more cusps and can extend down the side of a tooth. We often use our CEREC®, same-day restoration technology to custom-design and fabricate inlays and onlays, so they can be placed in one visit. A healthy smile can improve the health of your entire body, while also boosting your confidence. Contact DeMille MacKay Dental today to schedule an appointment at our North Salt Lake or West Valley City locations and learn more about your treatment options.